WASHINGTON — The House Oversight Committee is slated to vote Tuesday to issue subpoenas seeking information on both the White House security clearance process and on the process that led to the administration's controversial decision to add a citizenship question to the 2020 census. 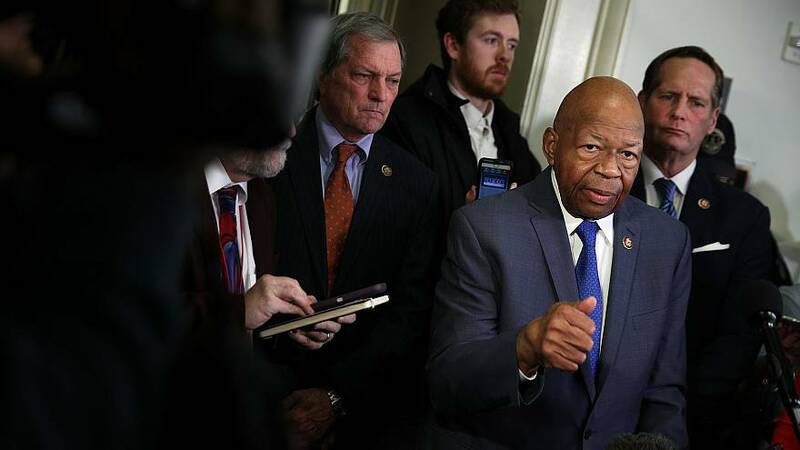 The panel, led by Chairman Elijah Cummings, D-Md., is expected to vote along party lines on a resolution to subpoena the testimony of former White House personnel security director Carl Kline to discuss the security clearance process at the White House. The vote sets up a confrontation with the White House, with primary targets for the Democratic-led probe including the president's daughter Ivanka Trump and his son-in-law Jared Kushner. Cummings has also raised concerns about national security adviser John Bolton and former national security adviser Michael Flynn. Cummings revealed on Monday that a White House whistleblower, Tricia Newbold, had told both Republican and Democratic committee staffers in both parties that 25 denials for security clearances had been overturned during the Trump administration. Ahead of the votes Tuesday, Cummings said that Newbold, an 18-year veteran of the security clearance process, raised concerns within the White House and in response was targeted for retaliation. "Yet despite these risks, she has agreed to identify herself publicly," said Cummings. "...Tricia Newbold came forward at great personal risk to warn the Congress and the nation about the grave security risk she has been witnessing first-hand over the past two years." Cummings argued Tuesday that a subpoena to seek Kline's testimony was necessary following his decision to decline the panel's January request for an interview, and failure to respond to the committee's follow-up letters. He added that Kline and the White House had reached out only after the whistleblower's story was disclosed Monday to say that Kline would "voluntarily comply" — but that he would not answer questions about specific officials, specific security violations and specific security clearance adjudications. "The White House needs to understand that they can't stonewall this committee for months," Cummings said. Rep. Alexandria Ocasio-Cortez, D-N.Y., while speaking in favor of the resolution to subpoena Kline, mocked Jared Kushner, the president's son-in-law, who reportedly used WhatsApp to communicate informally with the Saudi crown prince. "What's next, putting nuclear codes in Instagram DMs?" said Ocasio-Cortez. Meanwhile, Rep. Jim Jordan, R-Ohio, blasted Democrats for the process that led to the Newbold's interview. "I almost don't know where to start," Jordan, ranking member on the panel, said in his opening statement. Jordan slammed Cummings for scheduling the interview with Newbold "10 days ago on a Saturday," with minimal notice, and criticized Cummings for releasing a press release about Newbold on Monday in which he said the chairman "cherry-picked" her statements. House Intelligence Committee Chairman Adam Schiff, D-Calif., told reporters Tuesday ahead of the Oversight meeting that Democrats were "deeply concerned that the president may have been countermanding with the intelligence professionals...in terms of people who had conflicts of interest or who might be subject to compromise." "Those are serious decisions that are made by the security professionals. They're not something to be willy-nilly overturned by the president because he wants to give a family member a clearance or for some other improper purpose," he said. Separately, the Oversight committee was expected to adopt a resolution to issue a subpoena to Attorney General William Barr demanding all 2017 documents from both within the Department of Justice and its communication with outside entities regarding the administration's request to add a citizenship question to the census. That list would include a memo from James Uthmeier, who served as an attorney to Commerce Secretary Wilbur Ross, to John Gore, deputy assistant attorney general at DOJ, in the fall of 2017. The resolution would also authorize Cummings to subpoena Secretary Ross for documents related to the citizenship question. The committee's decision to issue the subpoenas comes a day before the House Judiciary Committee will vote Wednesday to authorize subpoenas for special counsel Robert Mueller's full and complete Russia report and its underlying evidence and documents.